The D‐Slim cushion by DDO is probably the most affordable low profile, light weight, pressure relief cushion available on the market. The cushion enables easy customization anywhere in the field to suit the user needs. The D‐Slim includes a contoured base, a top “interface” layer of high quality foam, and unique features which enhance pressure management and positioning. The cushion was designed with input from Jamie Noon, an independent consultant who holds patents and designs in commercial use, with 30 years of experience in rehabilitation technology of which 18 of those focused on developing countries. The D‐Slim was tested and met all the requirements for US Medicare coding for the E2603 Skin Protection Cushion. The design is consistent with the World Health Organization Guidelines on the Provision of Manual Wheelchairs in Less Resourced Settings and perfectly complements the Wheelchair Service Training Packages. 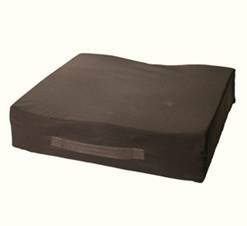 The D – Slim Pressure Relief Wheelchair Cushion design is the property of Diversability Development Organization. No part of this design, including all original concepts and ideas contained herein, may be reproduced or transmitted in any form, or by any means, electronic or mechanical, for any purpose without the express written permission of Diversability Development Organization. Lack of OR poorly fitted cushion can result in permanent deformity or pressure sores which can lead to death.